Located in the corner of the North Square is a memorial stone devoted to the memory of a President of France. 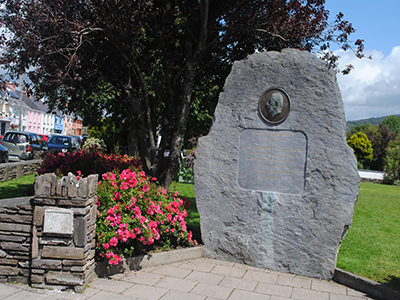 Charles de Gaulle visited Sneem immediately after resigning the presidency in 1969. Here, he sought a haven of peace and tranquility for two short weeks in the winter of his years. “At this grave moment of my long life, I found here what I sought, to be face to face with myself, Ireland gave me that, in the most delicate, the most friendly way”. A photographic exhibition of de Gaulle’s visit to Kerry is currently on display in the Kerry Geopark Information Centre in the South Square.